The Redemptorists » Rev. Pierce John Kenny, C.Ss.R. dies at age 68. Redemptorist missionary, Fr. 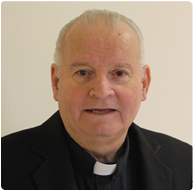 Pierce John Kenny, remembered as a dignified priest who never lost the common touch, died June 25 at St. Joseph’s Hospital in Towson, MD under the care of his religious confreres at St. John Neumann Residence, Stella Maris in Timonium. A viewing will be held in the lower church of Our Lady of Perpetual Help Basilica in Brooklyn, New York on Thursday, June 28 from 7:00 PM to 9:00 PM with a wake service conducted at 7:30 PM and a funeral Mass will be celebrated on Friday, June 29 at 10:30 AM, followed by interment at the Cemetery of the Resurrection in Staten Island. Please pray for Fr. Kenny, and for his family, friends, and Redemptorist confreres who mourn his loss.